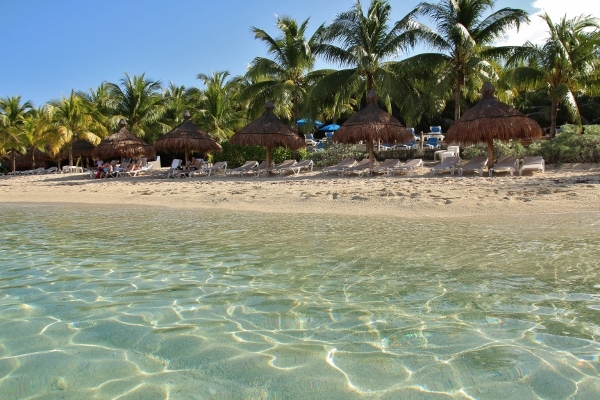 The first port of call for the revised Western Caribbean itinerary for our Very Merrytime Disney Cruise was Cozumel, Mexico. 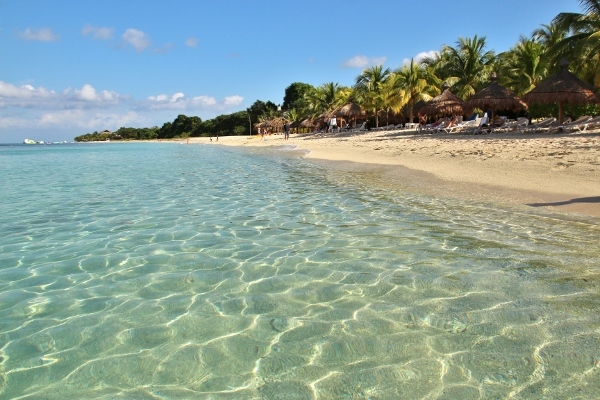 Cozumel is an island off the coast of the Yucatan Peninsula. 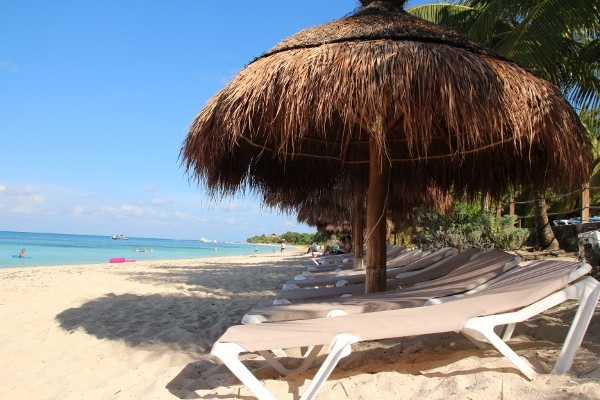 It's directly across from Playa del Carmen on Mexico's mainland. 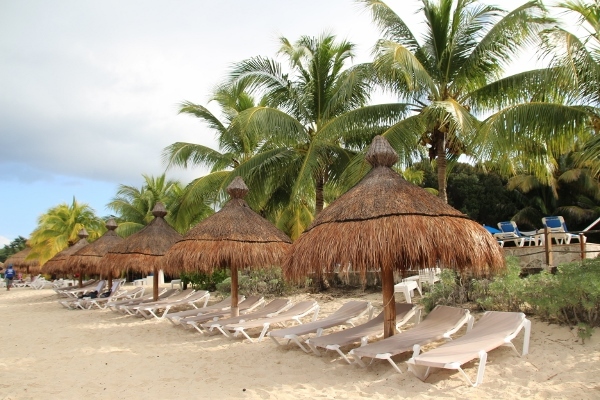 We had actually visited Cozumel on our previous Western Caribbean Disney Cruise a few years back but elected to stay on the ship that day to take advantage of a less crowded ship. This time, however, we definitely wanted to explore. 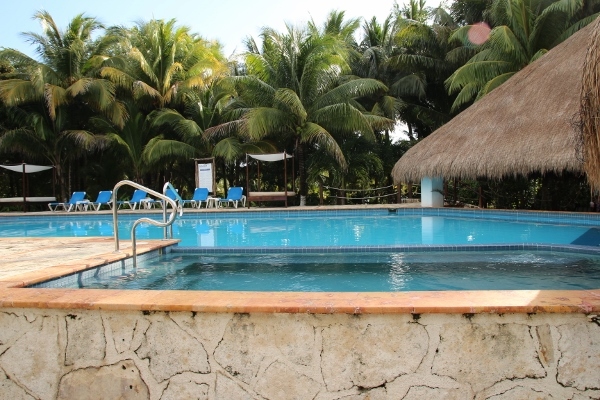 After researching various family friendly options for island fun, we decided to plan an independent excursion to Nachi Cocom Beach Club. 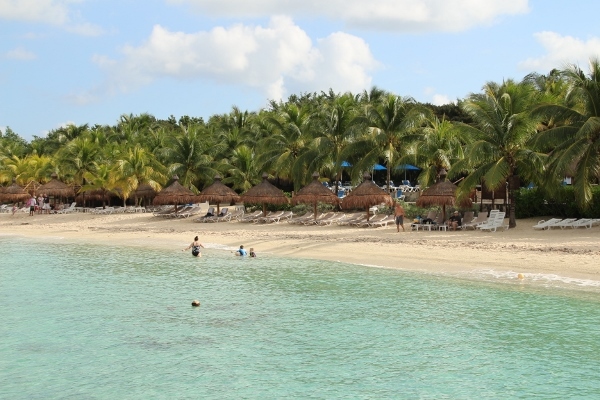 After an approximately 15 minute cab ride south, passing by a few other popular beach clubs such as Playa Mia and Mr. Sanchos, we arrived at our intended destination. 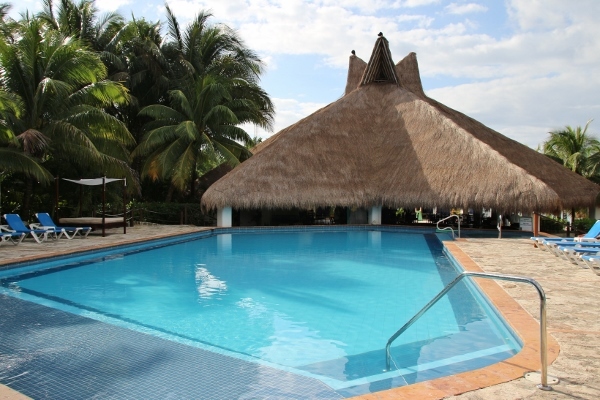 We had pre-booked reservations by putting down a small deposit in advance for their all-inclusive package, which is currently priced at $55 for adults and a fraction of that for children depending on age. 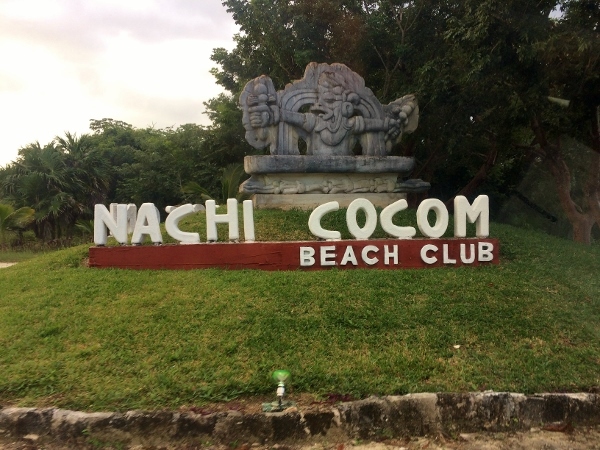 One of the main reasons we selected Nachi Cocom as opposed to some of their nearby competitors is that it has a more laid back and quiet vibe, while some other beach clubs feature a more spring break type (ie boisterous) environment, which is not what we were looking for. 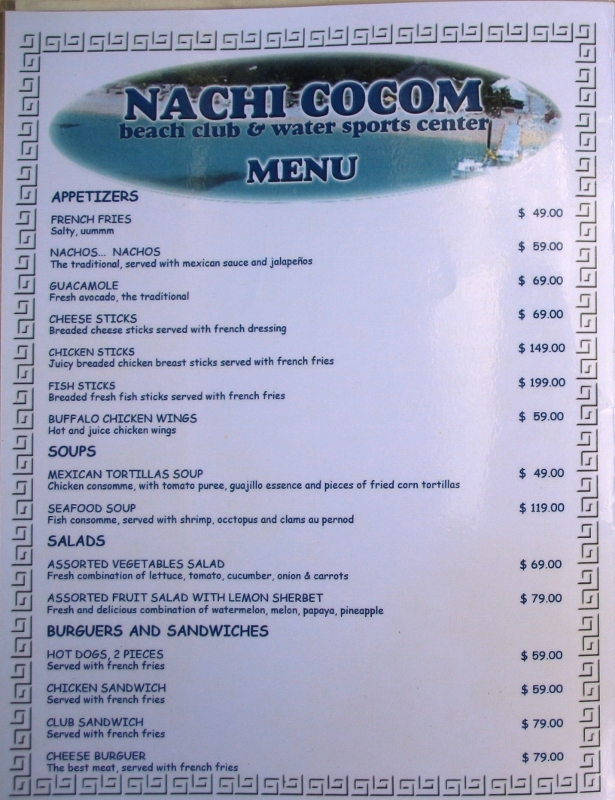 Per the Nachi Cocom website they limit the number of guests to 130 daily, but I can definitely attest that the day we were at the beach club there were likely no more than maybe 60 guests. It was very uncrowded and peaceful, absolute paradise. 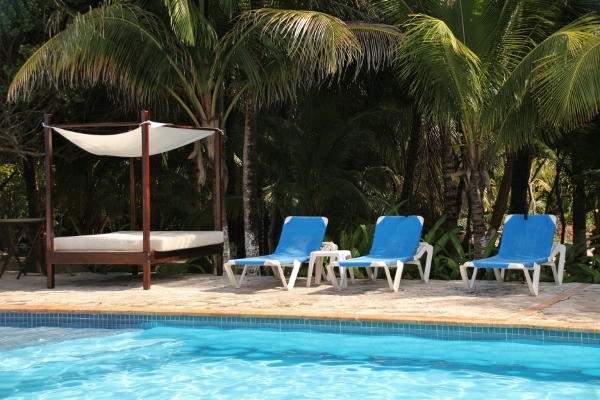 So you might be asking, "what's actually included in this all-inclusive package?" 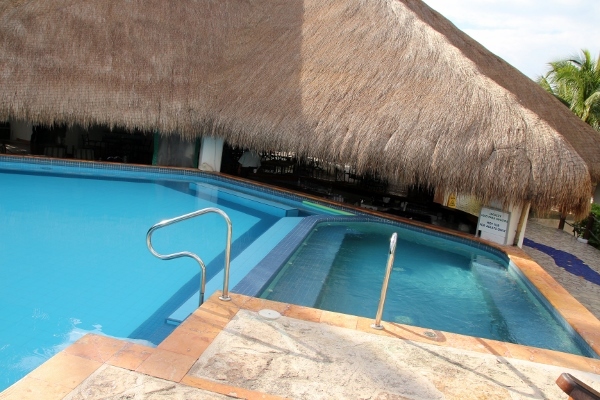 Well I'll tell you, almost everything: unlimited alcoholic and un-alcoholic drinks, a delicious and incredibly filling lunch with lots of options, private beach, lounge chairs, and beach club amenities including access to their pool and jacuzzi, palapas (natural umbrellas, which are first come first serve), changing rooms, fresh water showers (outdoor), and more. 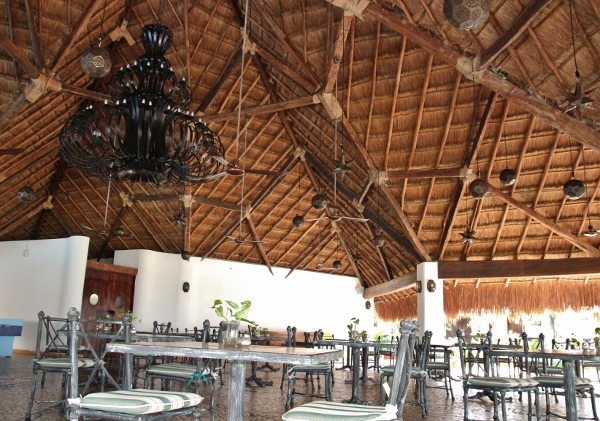 When we arrived at Nachi Cocom we checked in by turning in a copy of our reservation confirmation, paid the remaining balance, and then were escorted by our assigned server Manuel to a row of lounge chairs beneath a massive palapa. After settling in we decided to try some cocktails. I'll start out by saying that the pina coladas and Bahama mamas were both horrible. They were both blended with ice (typically Bahama mamas are served over ice, not frozen), but both had no flavor and were totally forgettable. 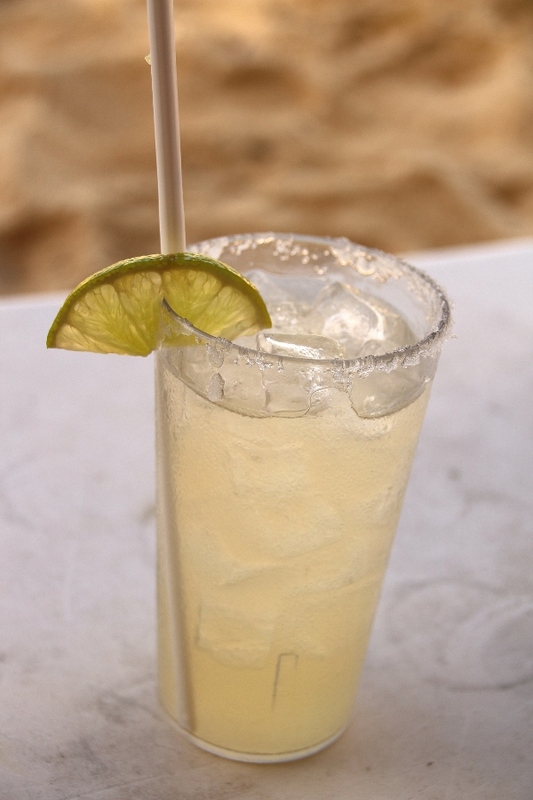 The real drink to order here is the margarita. It's actually quite good, and I had more than one especially when I realized the other drinks weren't really worth trying. 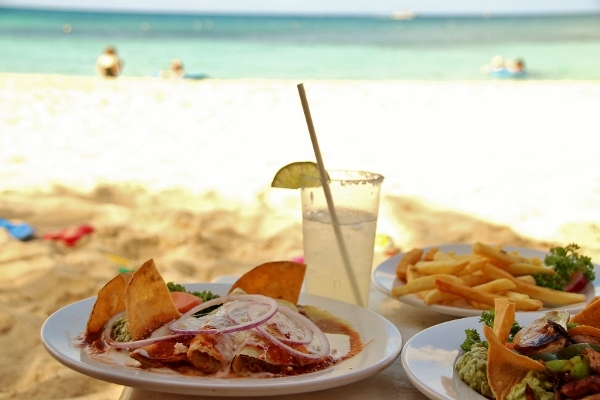 As lunchtime approached Manuel dropped off a menu. 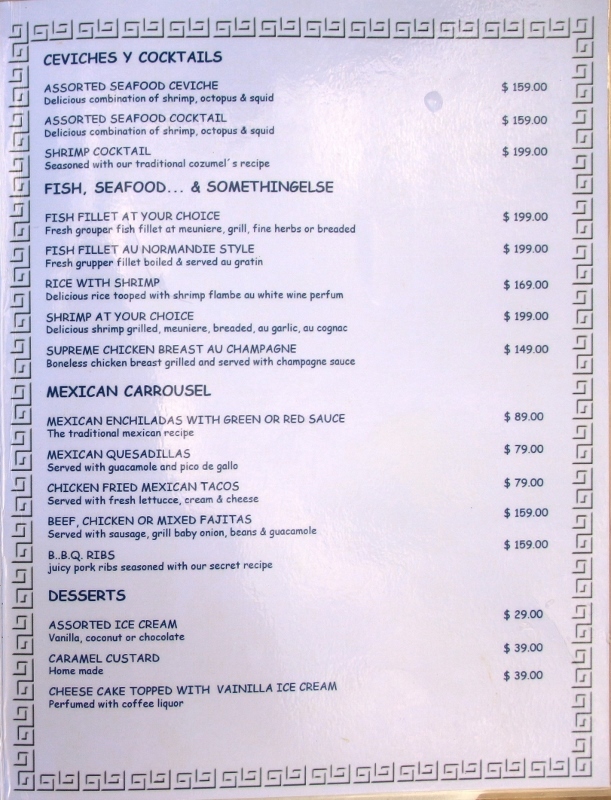 Please note, the prices for the menu items are in pesos, NOT in US dollars. Don't panic! Also, if you elect the all-inclusive package simply ignore the prices as they do not apply to you. As you can see this is a very extensive menu! My sister's family decided to eat at one of the patio tables by the pool, while my parents and I ate directly on the beach. Let's look at my sister's family's spread first. 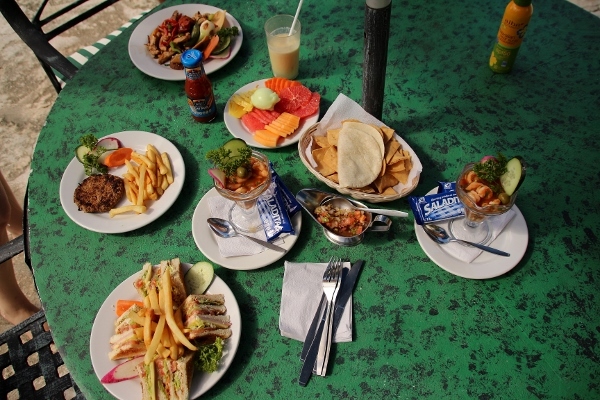 They got a club sandwich, chicken fajitas, shrimp cocktail, burger with no bun, and the assorted fruit salad. Every order came with tortilla chips and a small pitcher of salsa fresca made with habaneros. I didn't try it, but was told it was very spicy. The shrimp cocktail was a popular choice! My parents also got shrimp cocktails which I tasted. 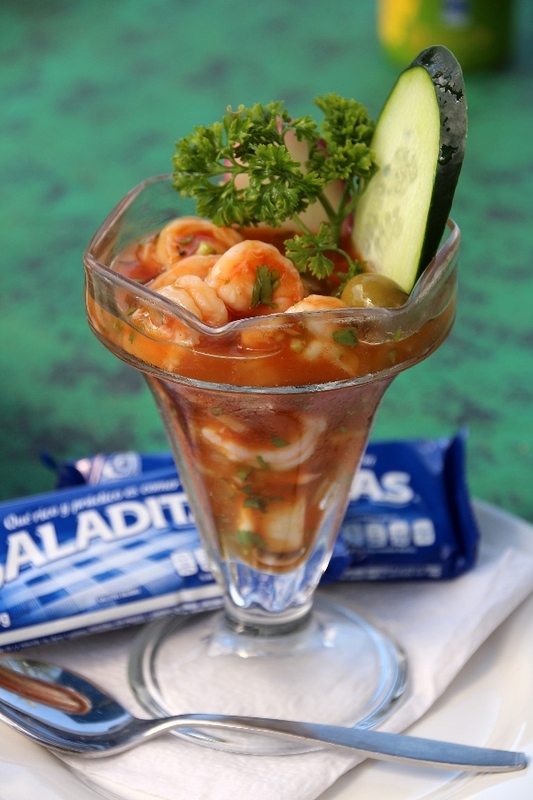 We confirmed the shrimp came from the gulf (as it should when you're in the gulf), and it was absolutely delicious. 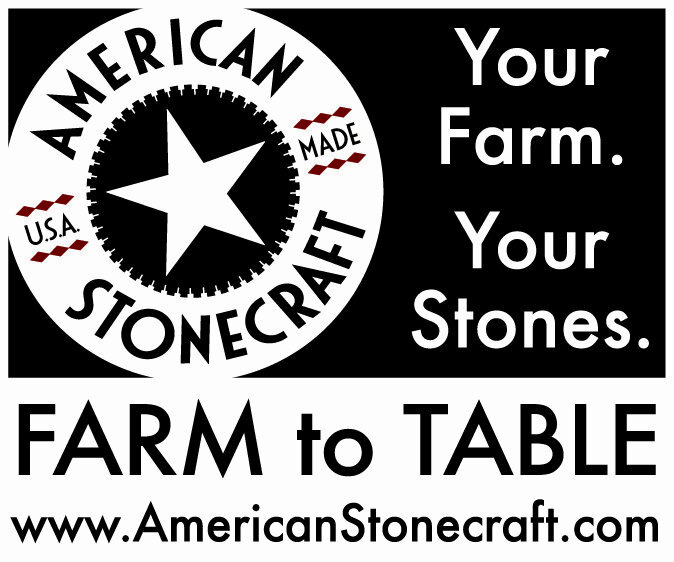 A really good choice, and a huge shareable portion! 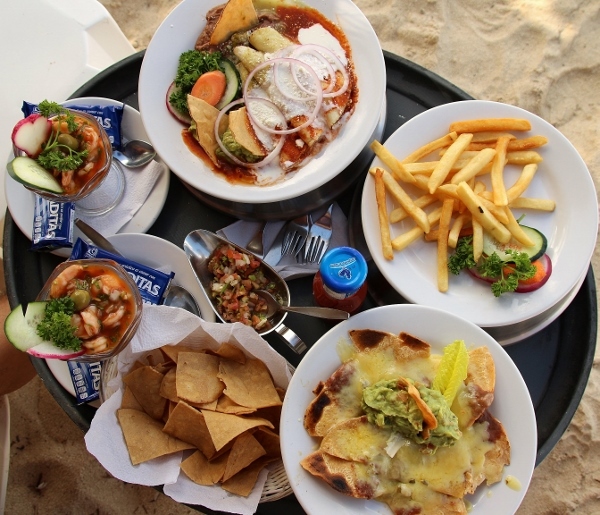 Our selection was served on a large tray right under our palapa on the beach. There are plates hidden under other plates (under metal lids), but here's what we ordered. My dad tried the tortilla soup to start along with his shrimp cocktail. I started with the nachos, which were quite basic but so good! 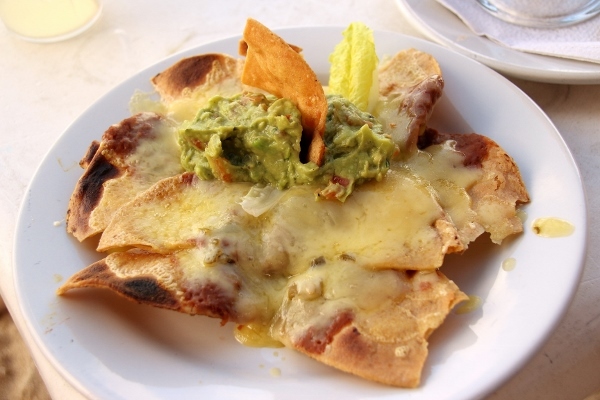 They were smothered with refried beans and melted cheese, and topped with a huge dollop of amazing guacamole. 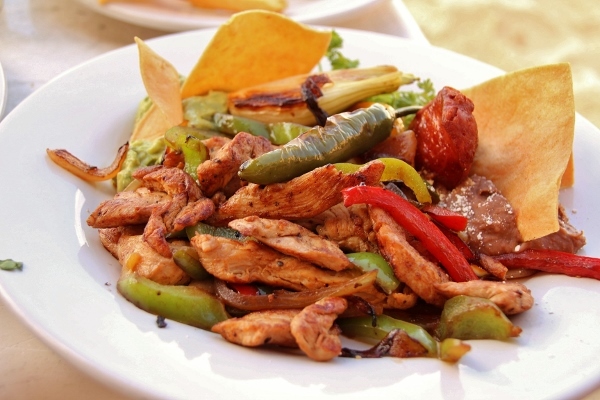 Both of my parents ordered the chicken fajitas as their entrees and were overwhelmed by the size of the portion (all the portions were very generous). They both agreed the fajitas were delicious, and ate them straight from the plate without stuffing the fillings inside the provided tortillas. There was just so much food! Mom also ordered a side of fries, which may have been overkill at this point, haha. 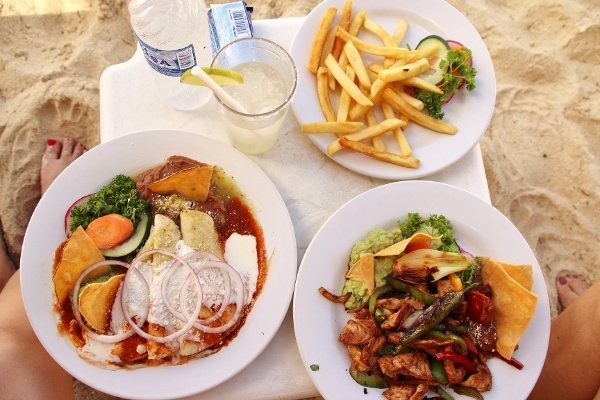 We really had no idea this would be so much food when we ordered it! 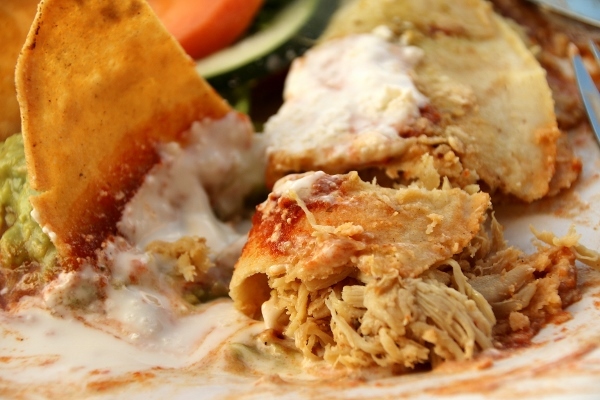 I couldn't resist the enchiladas, which were filled with pulled chicken and topped with a choice of red or green sauce. I got half and half of each sauce. 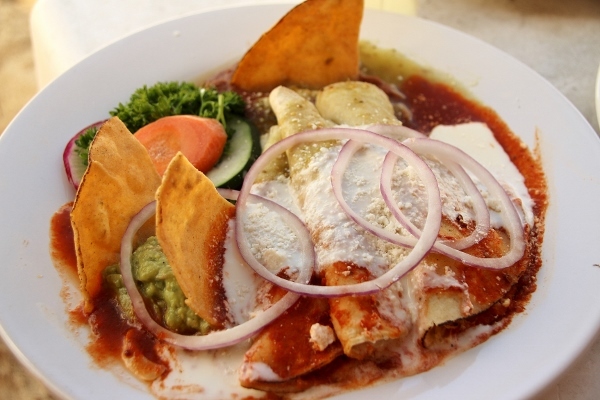 The three enchiladas were folded as opposed to rolled, topped with the sauces as well as some crema and red onions, and served with refried beans, another huge dollop of guacamole, and tortilla chips (same sides as the fajitas too). Holy enchiladas, Batman! They were as good if not better than I had hoped! 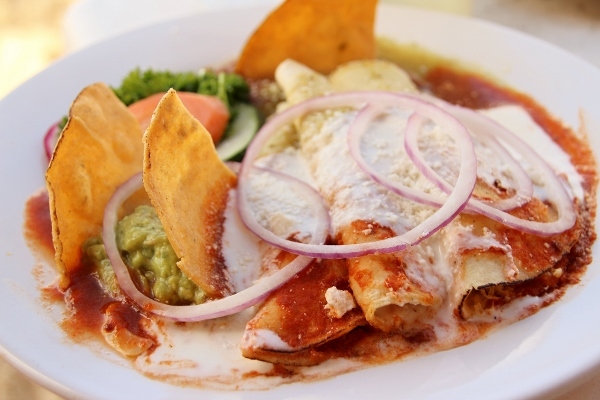 Both of the sauces were spot on, the tortillas were tender, and the simple filling was just the perfect canvas to dredge through the excess enchiladas sauces on the plate. I was 100% happy with my choice. In fact I could barely finish my food, but I managed to stuff every last bite of enchilada down my throat, haha. 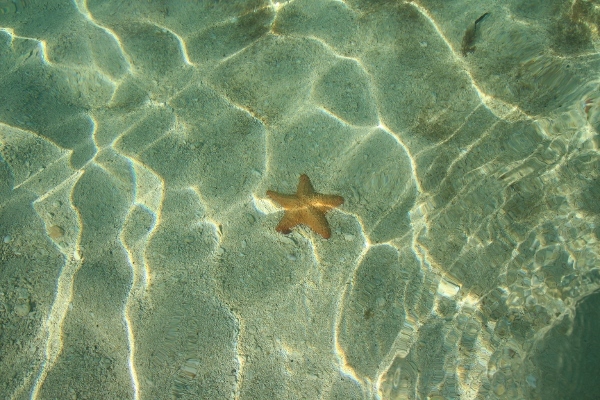 We spent a bit more time sunning ourselves in the sparkling clear water before taking a taxi back to the port that afternoon. I have to say, our day at Nachi Cocom actually exceeded my expectations! With the exception of a couple not-so-great frozen cocktails, everything was wonderful and I would definitely plan on coming back here again on a future visit to Cozumel. 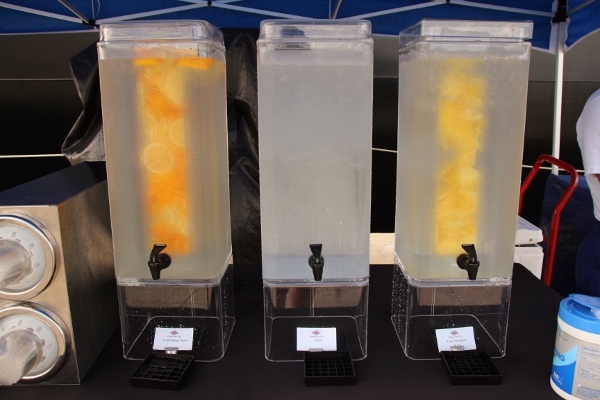 One of the little extras I enjoy so much about Disney Cruise Line is the selection of infused waters they serve when you return to the ship at a port. 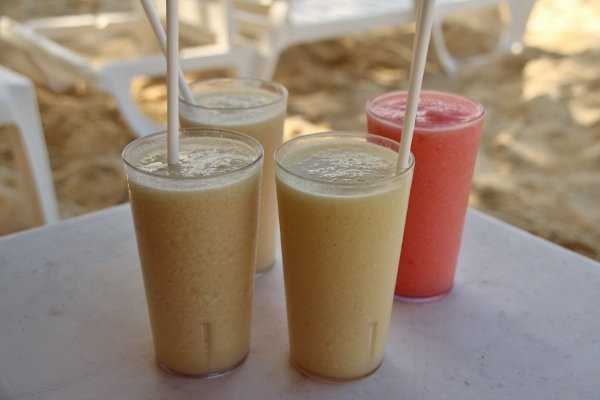 It's a great way to cool down on what is sure to be a very hot day in the Caribbean. 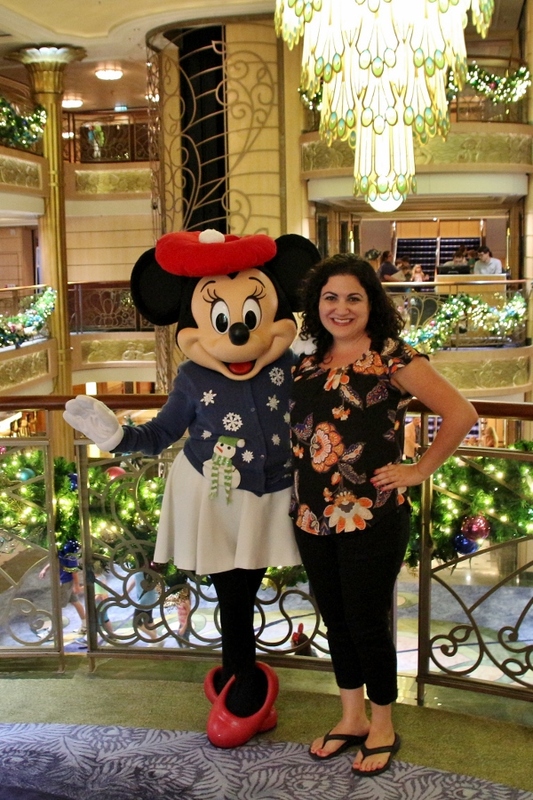 After washing off the remnants of the beach, it was time to get in line again for another photo op with Minnie. I desperately wanted a picture with her in her Christmas outfit. Isn't it precious? Dinner that night was at Royal Court. 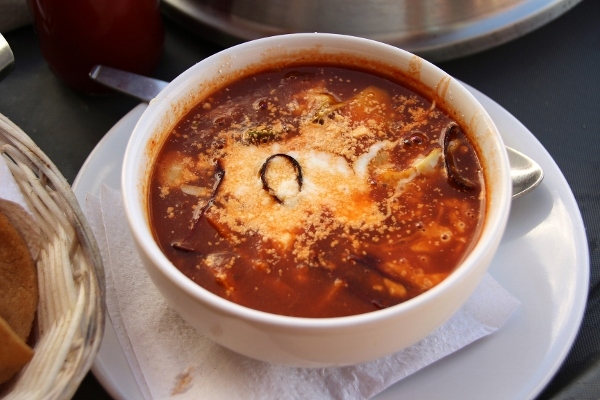 Instead of doing the double appetizers I had done the past couple days, today I picked two items off the soup/salad menu. Gotta keep things interesting, haha. 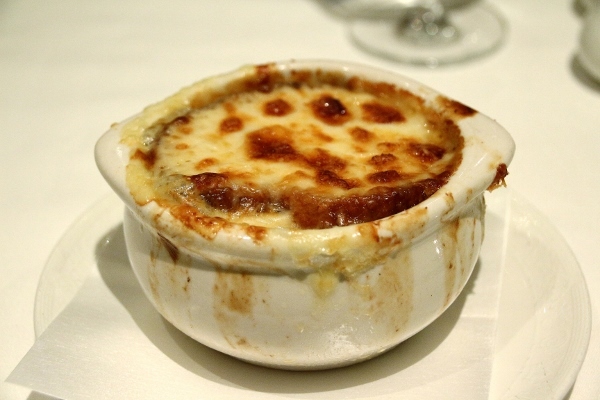 I began with the tried and true French Onion Soup. You really can't go wrong with this one. 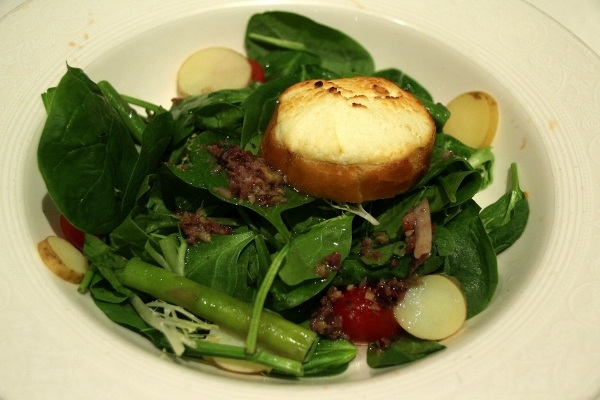 I also selected the Farmhouse Salad, which comes with baby spinach, asparagus, cherry tomatoes, fingerling potatoes, a goat cheese crostini, and an olive vinaigrette. Really the goat cheese crostini sold me on the salad, but it was a truly delicious French-inspired dish which was a light transition after the heavier soup selection. Let's check out a couple of my family's entrees before talking about mine. 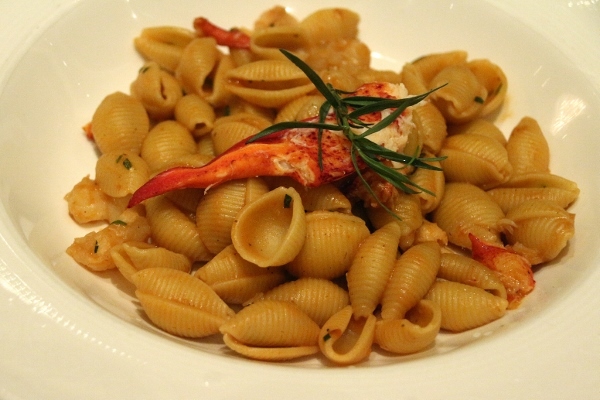 Dad ordered the Conchiglie Pasta with Buttered Lobster tossed in a tomato shrimp tarragon brandy sauce with lemon basil. He felt it was way undersauced, and he actually added some of the olive tapenade from the bread service to his pasta to dress it a little more. 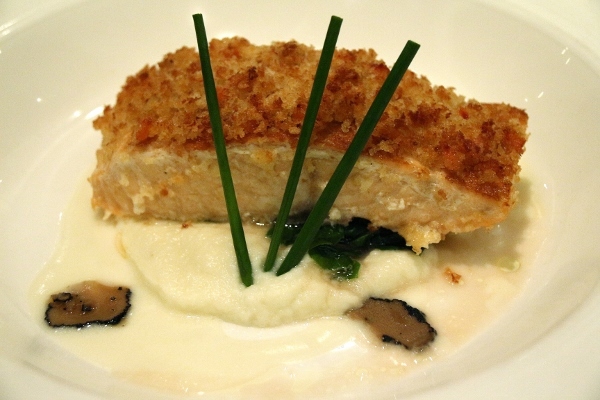 Mom picked the Oven-Baked Salmon Royale, which has a horseradish crust and is served with sauteed Swiss chard, truffled cauliflower puree, and white wine beurre blanc. This is a great choice, and one I have selected in years past. For the first time ever I selected an entree off the vegetarian offerings section, but I think it was the real winner of the night. I even convinced my sister to order the same thing, and she too was utterly impressed. 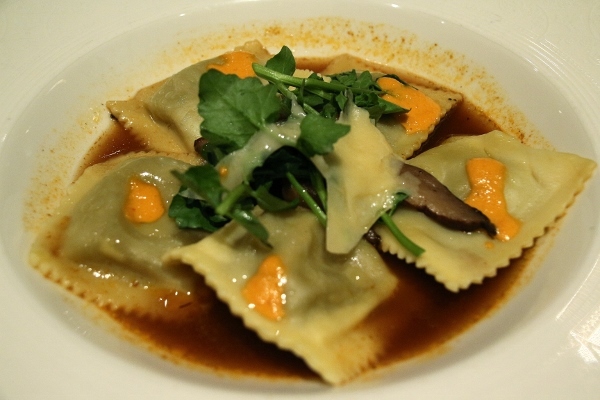 The Wild Mushroom Stuffed Pasta in a Vegetable Broth is topped with watercress, parmesan shavings, and a paprika oil drizzle. It was full of so much umami mushroom flavor that it would have pleased any pasta-loving meat-eater. Seriously, this is a great choice which I will likely order again in the future. 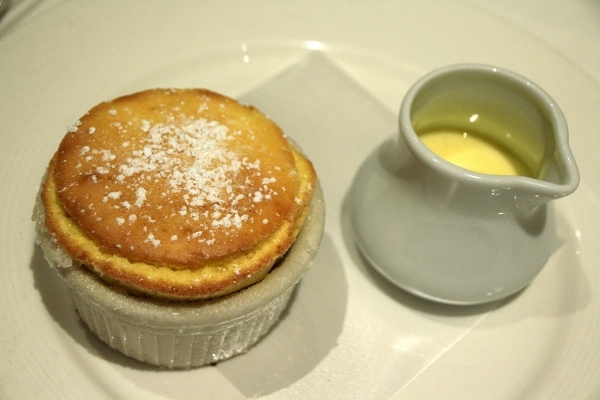 We can't skip dessert, especially at Royal Court because Royal Court features our beloved, not-to-be-missed Grand Marnier Souffle. I'm pretty sure I've ordered this on every single cruise in this dining room (and Lumiere's and Triton's on the Disney Magic and Disney Wonder respectively, which share essentially the same menu). There are certainly other desserts that look wonderful, but it's really difficult to pass over this one. Another fantastic day in the books aboard the Disney Fantasy. 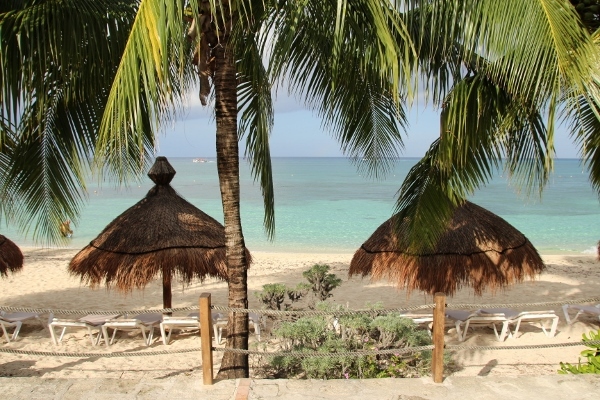 Next we're heading to Grand Cayman, so stay tuned!